The elegance and beauty of the Palmer House Hilton earns it a spot at the top of luxury hotel lists and it&apos;s location in the heart of the Loop makes it a popular pick for business and leisure travelers alike. But beyond the gilded ceilings and prized art works, the hotel represents another kind of treasure—tangible Chicago history. If you think history doesn&apos;t interest you or that it might even be boring, you clearly have not met Ken Price. As the hotel&apos;s charismatic director of public relations, official historian and story-telling secret weapon, he guides visitors on a fascinating journey with the "History is Hott!!" tour. "I decided that I wasn&apos;t going to teach dates but I&apos;d tell about personalities," explained Price, who was award Historian of the Year in 2014 by Historic Hotels of America. "Kipling said that you take the H and the I from history and you get a story." Indeed, you get lots of funny, incredible tales during the 1-hour-and-15-minute tour. You&apos;ll learn about the Palmer House&apos;s founder, Potter Palmer, and how he was inspired to build the hotel to woo his soon-to-be-wife, Bertha, whom he fell in love with when she was 13 and he was 38. He waited nine years to marry her and build the world&apos;s first fire-proof hotel. 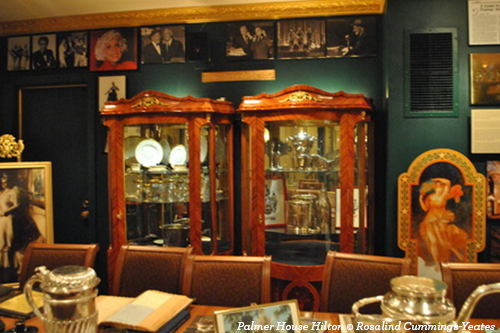 The tour also includes a stop by what used to be known as the Palmer House Museum, which is filled with artifacts, photos and books, and can&apos;t be viewed except on Price&apos;s tour. You can choose to start your tour with lunch at the Lockwood, which is topped off with another Palmer House creation: the brownie. Looking for the best Chicago hotels? Get more Chicago hotel spotlights on the blog. Explore other historic hotels in the city, or check out this cheatsheet with 20 hotels close to everything in Chicago — theaters, attractions and more.